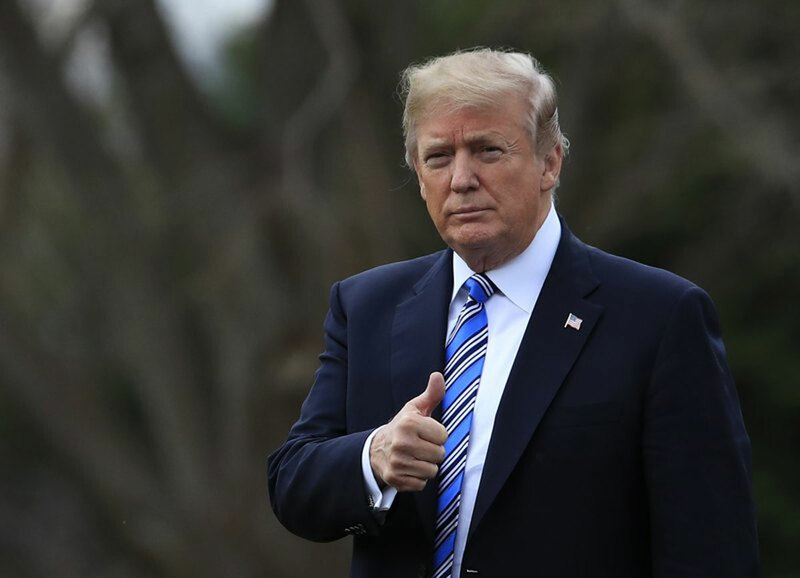 President Donald Trump’s Twitter cannon roared over the weekend as the latest turn in the Russia investigation seemingly placed him on the defensive. He denied he had ever absolved Russia of meddling in the 2016 U.S. election, despite his plentiful record of voicing doubts on that question. Resurrecting an old tale from the campaign, Trump also described a diplomatic transaction between the U.S. and Iran during the Obama years as a dark plot that should have been investigated by U.S. authorities. The transaction actually was money the U.S. owed to Iran from decades ago and one in a series of claims that were addressed by an international tribunal set up by both countries. Trump’s rash of tweets followed an indictment released Friday charging 13 Russians with running a massive social media trolling campaign and field operations in the U.S. aimed in part at helping him defeat his 2016 Democratic opponent, Hillary Clinton. The case brought by special counsel Robert Mueller provided the most concrete evidence yet of Russian attempts to subvert the election. And in September, he tweeted: “The Russia hoax continues, now it’s ads on Facebook,” referring to the discovery that Russian entities had posted ads on Facebook critical of Democratic candidate Hillary Clinton and supportive of him. Mostly, he has equivocated on the question of Russian interference, speaking at times as if he believes it happened and other times as if he does not, even as lawmakers, intelligence officials and some of his own aides say there is no doubt Russia meddled. He’s been consistent only in denying that his team colluded with Russia. THE FACTS: It’s not clear what there could be to investigate. In the late 1970s the Iranian government, under the U.S.-backed shah, paid the U.S. $400 million for military equipment. The equipment was never delivered because in 1979, his government was overthrown and diplomatic relations between the U.S. and Iran ruptured. In 1981, both countries agreed on a commission at The Hague to rule on claims by each country for property and assets held by the other. Iran paid more than $2.5 billion to U.S. businesses and citizens to resolve claims. In January 2016, the U.S. agreed to settle an Iranian claim, paying the $400 million and committing to follow up and pay $1.3 billion in interest, for a total of $1.7 billion. U.S. officials said they settled because they expected the tribunal to rule on the claim soon and assess higher interest. The Obama administration delivered the initial payment the same day Tehran agreed to release four American prisoners, and later acknowledged the cash was used as leverage until the Americans were allowed to leave. THE FACTS: H.R. McMaster, Trump’s national security adviser, would have had no basis to say Russia failed to impact the U.S. election because that is an open question. McMaster said in remarks the previous evening that the indictment provides “really incontrovertible” evidence of Russian malfeasance in the election. The indictment does not allege collusion between Russia and the Trump campaign and does not assert that Russia’s deeds tipped the election in Trump’s favor. But Mueller’s investigation continues and nothing is ruled out. U.S. intelligence agencies, however, have reached no such conclusion. This much is thought to be true: Russia is not known to have succeeded in manipulating voting systems or ballots. Officials said as much months ago. But since then, much more has been discovered about the Russian assault on Facebook, Twitter and Google as propagandists pushed fake or negative news to readers to deepen public discord and influence opinions on whom to vote for. Now the Mueller indictment adds voluminous detail to that understanding. But Pence’s apparent equanimity on the subject was not shared by Trump’s director of national intelligence in testimony to senators Tuesday. “There should be no doubt that Russia perceives its past efforts as successful,” Dan Coats said in warning that Moscow was already meddling in the 2018 midterms. Coats said Russians “upped their game” in the 2016 election, “took advantage, a sophisticated advantage, of social media” and interfered in “pervasive” fashion — a conclusion underscored by the criminal charges brought Friday.